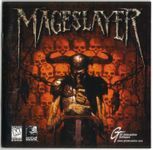 MageSlayer is a computer game released in 1997. It was based on the Vampire engine, developed by Raven Software, along with Take No Prisoners. The engine provides a top-down view with 2d sprites for the character and monsters in a full 3d environment with dynamic and coloured lighting. The score was composed by Kevin Schilder. MageSlayer marked another Raven Software collaboration with the fantasy artist Brom, who produced the box cover artwork for the title. Source: Wikipedia, "Mageslayer", available under the CC-BY-SA License.